One of Ray Bradbury’s most famous astronaut stories, “Kaleidoscope,” isn’t really about astronauts. Granted, it seems like it is: Published in Bradbury’s 1951 collection The Illustrated Man, “Kaleidoscope” depicts the final hours of a spaceship crew returning to Earth. Hit by a meteor storm, the ship is destroyed—and a handful of spacesuit-clad survivors float through the void, deeper into Earth’s gravity. Via helmet radio, they argue, confess, and try to reconcile their lives, realizing they’re about to combust and evaporate as they reenter the atmosphere. But the story isn’t about them. It’s about a boy. In the last five sentences of “Kaleidoscope,” the perspective jumps to the ground, where an unnamed kid peers into “the sky of dusk in Illinois” and wishes upon “a blazing white star” that shoots across the horizon. And as he wishes, he wonders. It isn’t spelled out, but a circuit is complete: A sense of awe sent man into the heavens, but just as awesome is his fall. Without a boy and his wonder, “Kaleidoscope” might be a solid yet morbid piece of space-age psychodrama. With him, it becomes sublime. Bradbury, who died on June 6 at age 91, was once that boy. Born in Waukegan, Illinois, he grew up enthralled by literary space-travelers such as Edgar Rice Burroughs, whose Barsoom series inspired Bradbury’s obsession with Mars, culminating in Bradbury’s 1950 mini-opus, The Martian Chronicles. Like his iconic 1953 novel Fahrenheit 451, in which “firemen” burn all books to keep any potentially controversial or dangerous ideas from the populace, Chronicles projects Bradbury’s fears onto the future. But in the case of Chronicles, Bradbury’s thousand-year stare gains an even sharper focus, even as he stands his Midwest ground. “One minute it was Ohio winter,” begins “Rocket Summer,” the opening story of Chronicles. “And then a long wave of warmth crossed the small town.” From there, the meaning of the title becomes poetically vivid. The launch of a rocket from Ohio in 2030 melts the January ice—as sure as a fireman’s torch incinerates paper, or Earth’s atmosphere turns an astronaut into a flash of vapor. Bradbury was one of hundreds of science-fiction authors coming into their own in the pulp-packed ’50s. In many ways, his work differs little from theirs. Bradbury’s stories contain rockets and aliens, time machines and robots. But unlike his contemporaries, Bradbury had a secret weapon, a reservoir of small-town wonder that no one could credibly emulate. Even at their wildest, his stories were somehow filtered through the wide eyes of a kid from Illinois. Then—in semi-autobiographical fantasies like 1962’s Something Wicked This Way Comes, 1957’s Dandelion Wine, and its 2006 sequel (and Bradbury’s swansong) Farewell Summer—he turned Waukegan from backyard to milieu. Fictionalized and named Green Town, it became Bradbury’s Middle Earth, suffused with innocence, renewal, bucolic mystique, and the inevitable darker side of all those things. Bradbury was sentimental, but he could also be brutal—especially when, as in “Kaleidoscope,” he plunks Green Town underneath the cold, dark vacuum of the unknown. In an account of 17th-century science, The Clockwork Universe—a book with a distinctly Bradburian title—author Edward Dolnick notes, “We think of scientists as chucking out old ideas when something newer and more plausible comes along, but that is not the usual pattern. More often, scientists take up the new but cling to the old as well.” Bradbury understood this. Better yet, he transplanted it from science to science fiction. Rather than being monolithically utopian or dystopian, gleaming or grim, his visions of the future blur together today and tomorrow. It made these visions more accessible, but more deeply, it tapped into the notion Dolnick puts his finger on: that the present isn’t a time unto itself, but an overlap of the past and the future. That’s why, in “Kaleidoscope,” Bradbury’s jump from space to soil is more than simply dramatic. It’s anachronistic. According to so many of Bradbury’s science-fiction contemporaries, the future would naturally be unrecognizable, scrubbed and sanitized of all traces of today. Bradbury thought otherwise, or at least he wished it so. In “The Rocket,” another of The Illustrated Man’s poignant tales of tomorrow, some people take trips to the stars, and others are stuck in junkyards. Time pops up everywhere in Bradbury’s work. Long before he had began to grow old, he speculated on the emotional and philosophical aspects of aging, most notably in Dandelion Wine. The book’s main character, Douglas—another boyhood reincarnation of Bradbury—encounters what he calls a “time machine.” Only it isn’t a machine at all, but a man, one with a lifetime of memories on which Douglas can travel. Bradbury deals in literal time travel, too. One of his most enduring and influential stories, 1952’s “A Sound Of Thunder,” theorizes—with a bit of shaky logic—that something as small as stepping on a butterfly in the past could result in massive changes to the future. Like that squashed butterfly, “A Sound Of Thunder” has influenced the world in ways Bradbury could never have predicted. It helped inspire (and provided the name for) the butterfly effect, a cornerstone of Edward Lorenz’s chaos theory. From there, it seeped into the zeitgeist, inspiring scores of thinkers, artists, musicians, filmmakers, and writers. 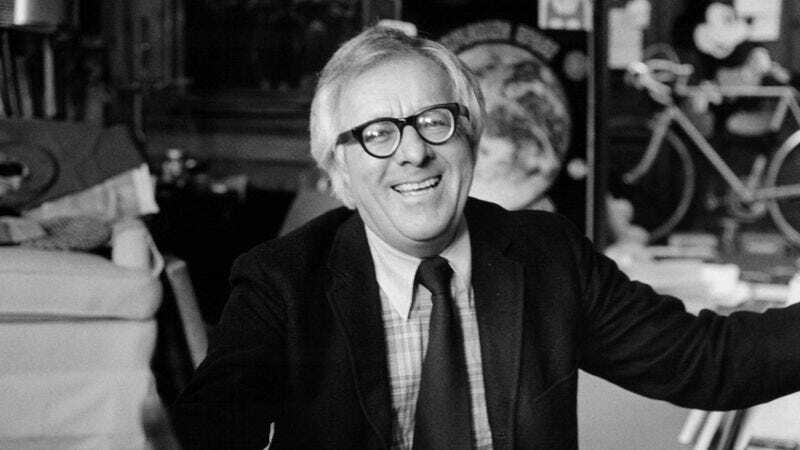 “It is hard for me to believe that in one lifetime I have written so many stories,” Bradbury states in the introduction to 2003’s Bradbury Stories—a staggering 900-page collection that represents, at best, a quarter of the short stories he wrote throughout his 91 years. “But on the other hand I often wonder what other writers do with their time.” Coming from a lesser soul, that might sound gloating or boastful. Bradbury was neither. He remained, at his core, a small-town kid, flush with the rocket fuel he produced and consumed since he was a boy peering up at the sky of dusk in Illinois: wonder.